After escaping single-digit temperatures in Oklahoma, we spent the last couple of nights at Santa Rosa Lake State Park in New Mexico. The town of Santa Rosa advertises itself as “The City of Natural Lakes,” but the lake we’re on is man-made, courtesy of a dam on the Pecos River. 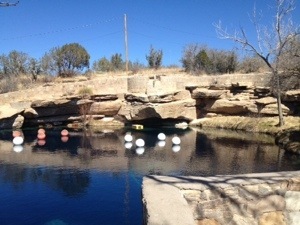 The town does have some small lakes and something called the Blue Hole, which turns out to be an artesian well 81 feet deep that is a favorite haunt of scuba divers, though no one was there when we stopped. We drove about 10 miles south to Puerto de Luna, a settlement founded by Coronado that, local legend has it, was once visited by Billy the Kid. It has an odd mix of palatial haciendas and modest houses. We enjoyed our time here, not least because of the warmer weather. We spent part of our time just sitting in the sun and baking out the cold. Now it’s on to Arizona. Is that the railroad bridge that goes over the river where all the Joads go bathing? Great scene! I believe so. It’s been a long time since I saw the movie. Arizona! I strongly recommend two stops: the Meteor Crater, near Winslow (http://www.meteorcrater.com) and La Posada Hotel in Winslow (http://www.laposada.org) — totally worth a visit and a meal even if staying there doesn’t fit your schedule. I stopped at both during that Postcards tour back in 2010 (http://chronicle.com/blogs/postcards/on-route-66-get-your-kicks-from-tourist-landmarks/595). We are camping for two nights at Homolovi State Park just outside Winslow, so we’ll try to take your advice. The park ranger also recommended La Posada, though she said it was an expensive place to eat.